Normally, one doesn't associate premium pricing with Chinese food. However, it is probably more to do with accessibility and availability as well as the common images of combo #5. 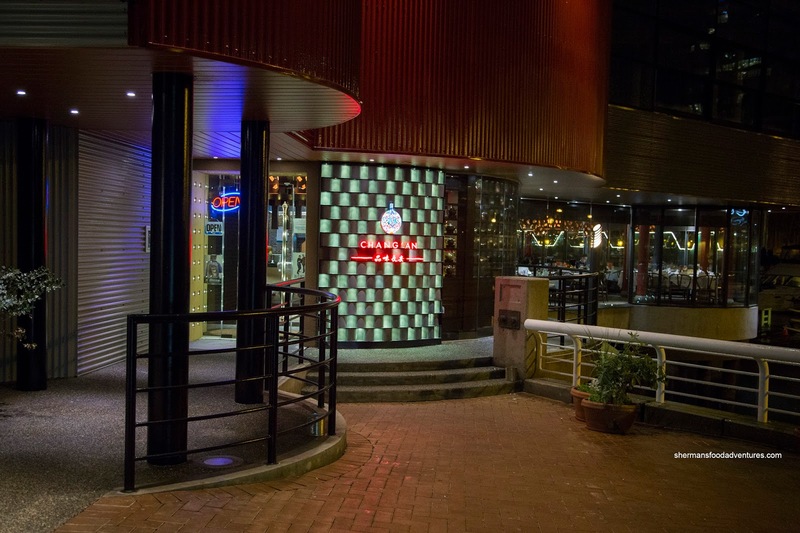 So when we open up the menu at places such as Red Star and Kirin, we suffer a form of sticker shock, despite the fact we would gladly spend upwards of $30.00 for a small plate of "fine-dining" food elsewhere. 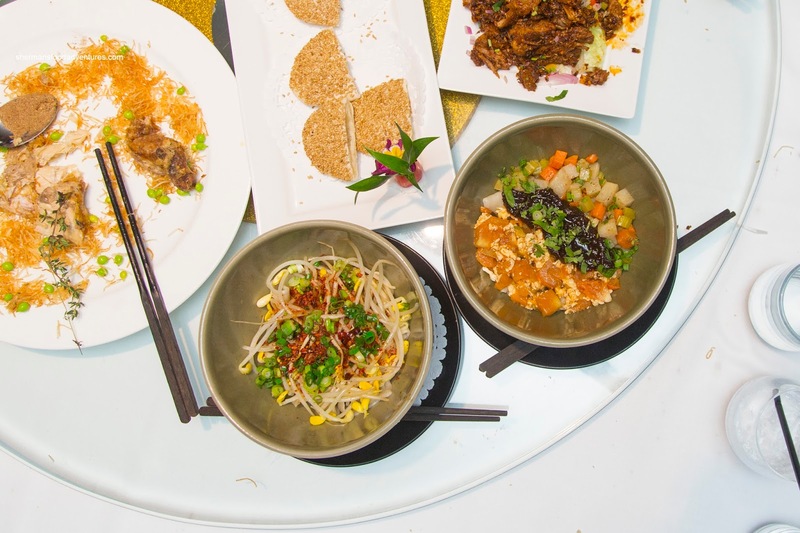 The newly opened Chang'An pushes the envelope further with even higher prices and a certain fine-dining flair of its own in the former Downtown location of the Stone Grill (and before that, Anderson's). For some time, I've been formulating a reason to visit the place. However, with a sudden invite from ChineseBites, there was my chance to see what the place was all about without taking out a second mortgage. 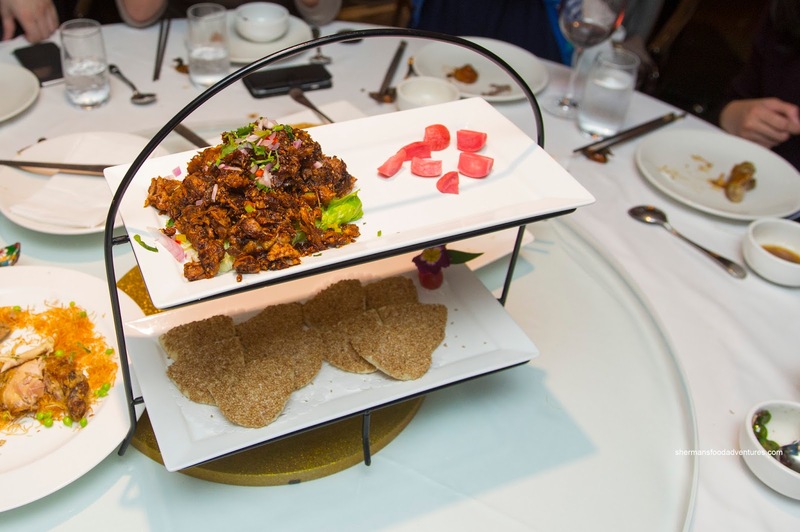 We kicked things off with their signature dish being the Chang'An Duck. 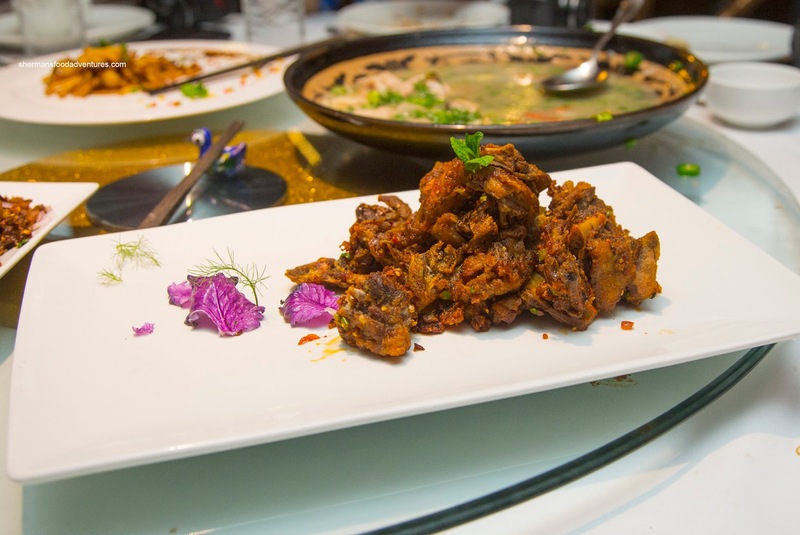 Unlike most other Chinese restaurants (who deep-fry pre-prepared ducks), the one at Chang'An is made to order by reservation only. It is roasted for an hour and served according to the reservation time. For us, we sampled the crispy and airy skin with sugar first. We found the fat to be almost completely rendered down leaving behind a thick layer of lightly crisp skin. The aromatics went well with the sweetness of the sugar. 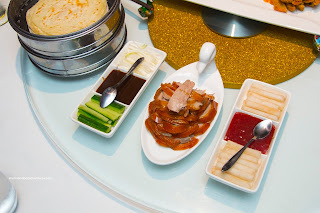 Next, we were served the rest of the duck meat Beijing-style with crepes, hoisin, cucumber and something different - house-made strawberry jam and Asian pear. 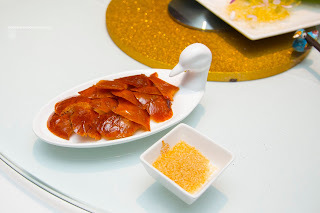 Attached to the same skin, we found duck meat that was moist and juicy while not still exhibiting a firmer duck texture. Arriving at the same time, we were presented with a large platter consisting of Tossed Cilantro, Scallion & Red Peanut Salad, Marinated Mushroom, Crispy Beef Tongue and Honey Grapefruit Spare Ribs. I didn't really care for the salad as it looked and tasted more like a garnish. However, the mushrooms were addictive. They were firm, yet moist at the same time with an intense Earthiness. As much as I love tongue, I wasn't particularly impressed with their version. The breading was crispy, but slid off the greasy tongue. There wasn't a whole lot of flavour to it either and I really didn't want to use the side of sweet chili sauce. Sticky, sweet and fall-off-the-bone tender, the ribs were the best thing on the plate. 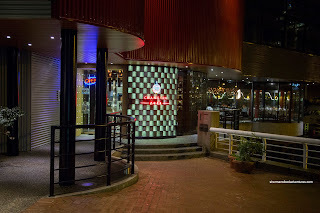 I liked how they fried the ribs which resulted in a crispy exterior with appealing crunchy bits. Beyond that, the meat was easy to chewy while the glaze was sweet with a bit of fruitiness. 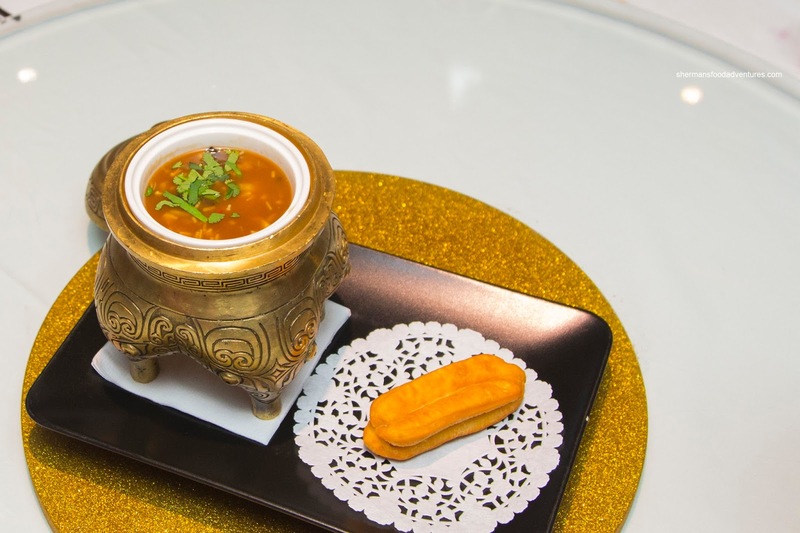 Majestically plated and served in a heavy urn, the Imperial Hot & Sour Soup exhibited a significant spicy kick from start to finish. In fact, the spice level continued to build as we ate and definitely lingered after we were finished. There was a nice viscosity to the broth where it wasn't overly goopy (as in too much starch) nor did it thin out after a few spoonfuls. 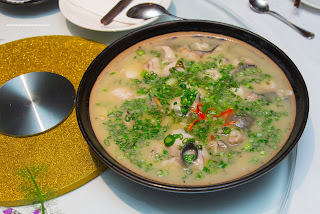 Due to the elevated spiciness, the sour aspect of the soup was less apparent even though it was plenty impactful. Hidden within the soup was a one large prawn that was cold-water crunchy. Served on the side was a Chinese donut that was a bit too dense. It wasn't greasy though and it softened up a bit after dunking it into the soup. 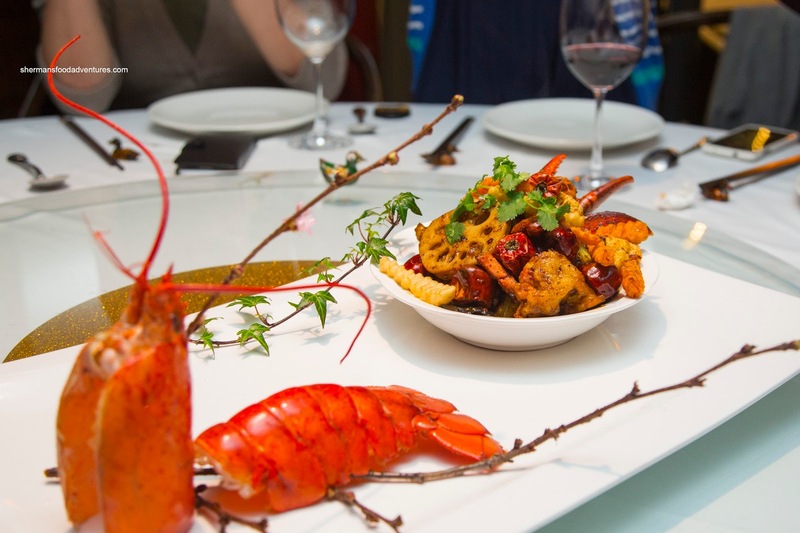 Once again, our next course, House Special Fried Chili Lobster, was attractively plated. In addition to the fried pieces of lobsters, there was bits of cauliflower, lotus root, peppers and crinkle fries (yes, both regular and yam!). As much as the lobster was properly prepared with a slight bounce texture, the star of the show was the crunchy cauliflower. It was the perfect blank canvas for the savoury, aromatic and spicy sauce. 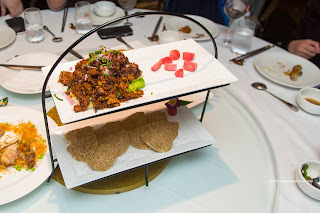 As much as the Szechuan Peppercorn Beef didn't look like much, I really enjoyed it. The beef itself wasn't actually all that tender, but it had this appealingly chewiness to it with bits of tendon. It was soaked in a spicy broth that was full-flavoured and slightly tongue-numbing. Blessed with a soft chew, the tofu noodles and enoki also soaked up the flavours. Presented whole before being cut up table side, the Chang'An Gourd Chicken was served with a side of wok salt. Featuring a battered crispy skin, it was surprisingly somewhat rendered despite the extra coating. As a result of the batter, the meat was kept moist and succulent, including the white meat. Since the chicken itself was rather mild and natural-tasting, the salt was necessary to bring out the flavours. 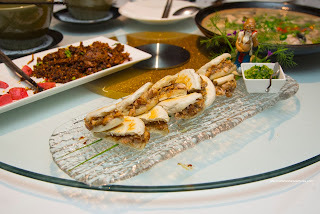 Presented like it was high-tea, the Shao Bing with Qin-Style Roast Lamb Leg was appealingly savoury. 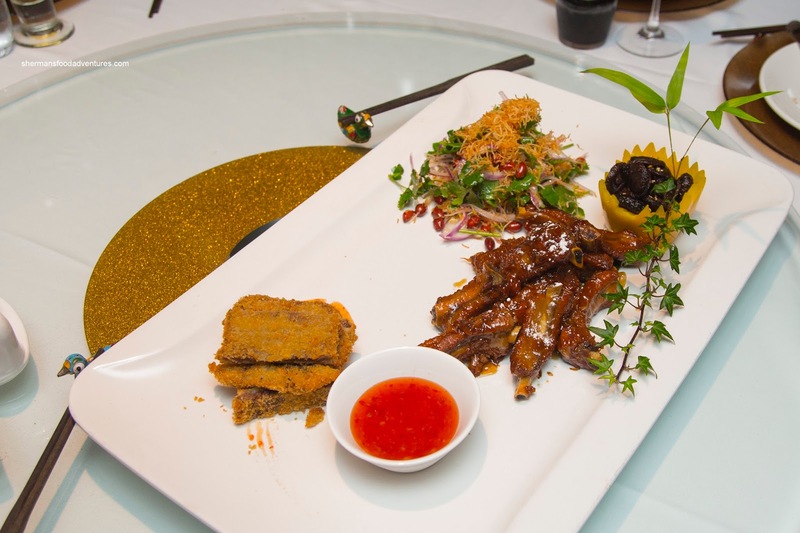 With a combination of shredded and large chunks of moist lamb, the filling for the shao bing was rich, slightly smoky and definitely spicy with impactful flavours. The shao bing itself was flaky and crispy with a warm and soft interior. 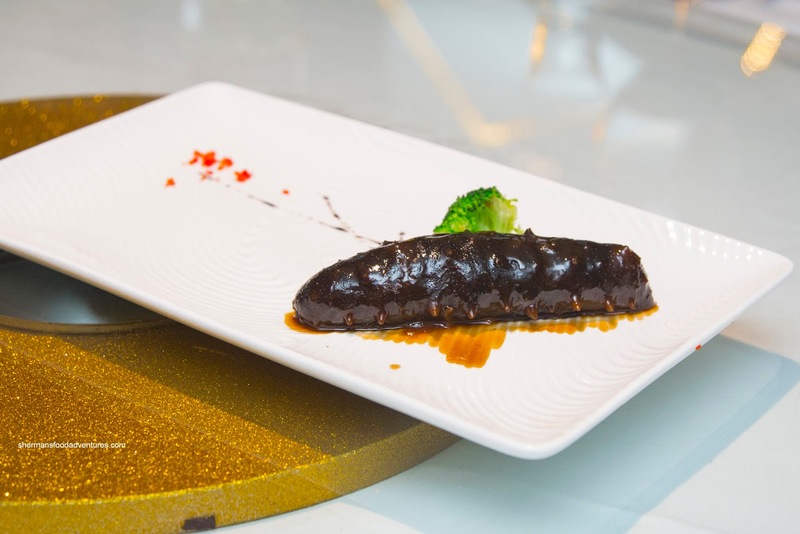 If the the meal wasn't already decadent enough, we were presented with one whole Braised Sea Cucumber each served on a custom plate. 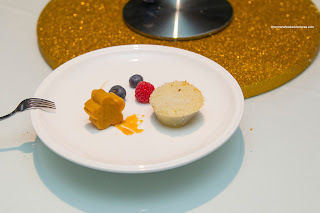 FYI, this dish was $50.00 each if you were wanting to spend some dollars. I guess if you had USD, it would only be $35.00... Braised for 48 hours with 20 herbs and spices, the sea cucumber rode the fine line between soft and firm. It was gelatinous with an appealing firmness. 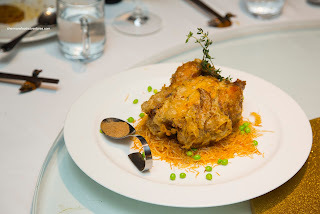 The braise fully penetrated where the flavours were rich, impactful and aromatic. I liked how they built flavour without a complete reliance on oyster sauce (where it would be too salty). Another one of my favourites was the Braised Whole Chili & Spring Onion Cod which was presented in a large shallow bowl. 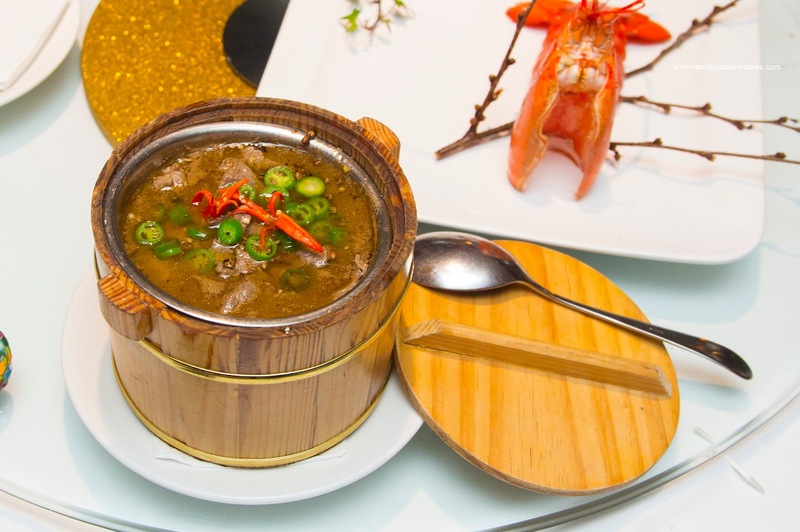 As much as the broth was mild with natural sweetness from the fish, the random red chili peppers added hits of spice dependent on the spoonful. I found that the spring onions brightened up the dish where the broth was somewhat greasy. As for the fish, it was buttery and soft while being flaky. I could've eaten the whole dish if it weren't for the gluttony that stay lay ahead. Moving on with the Pork Belly Mini-Sliders, these were stewed slowly with 20 spices. This was exemplified by the rich flavours emanating from the tender and moist pork belly sandwiched within the soft bao. Although there was a side of ginger-onion condiment, the sliders tasted better without it as it didn't allow the subtle spices to come through. Up until now, we noticed that some of the dishes were "fine-dining" portions. Well, the Sweet and Sour Lychee Prawns didn't look out-of-place in terms of portion size. 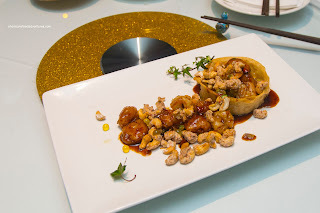 Despite that, the dish itself was pleasant enough with sweet fried lychees and meaty prawns. I thought the sauce was more sweet than sour while there was just the right amount. For me, I loved the roasted cashews as they were aromatic and sweet. 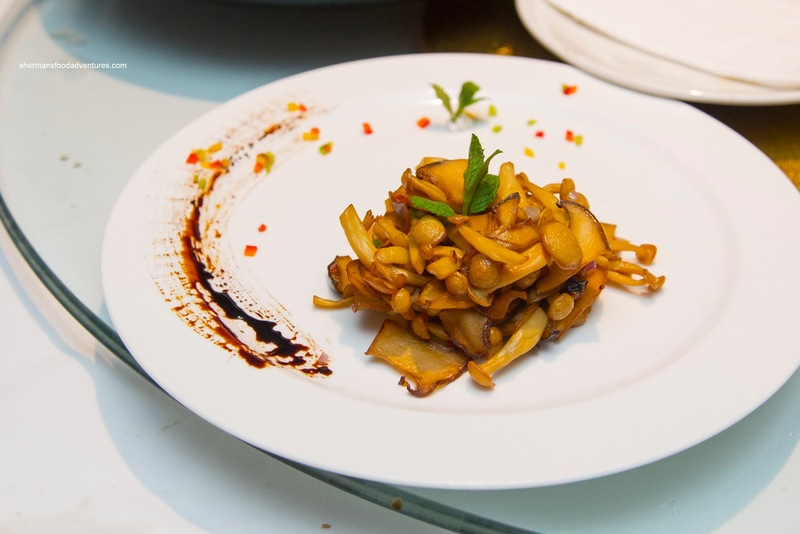 Continuing with another smallish portion, the King Mushroom Casserole looked more like a side than a shareable dish. What it lacked in quantity, the quality completely made up for it. With nary a drop of moisture, the mushrooms were obviously subjected to consistent high heat which caramelized and concentrated the woodsiness of the mushrooms. They were lightly seasoned, hence, the smokiness from the work fry came through. We then moved onto 2 bowls including the Biang Biang Noodles and Three Sauce Noodles. Both featured chewy noodles that were a bit clumpy. It was a bit difficult to separate the noodles until a pair of scissors arrived. I preferred the biang biang noodles as there was enough spice for impact.